Freedom Caucus frightened by criticism for allowing Paul Ryan’s House Speaker bid: Conservatives seek a deal to avoid primary threats. These far right conservatives want a special deal to shield them in the primaries. Reps. Mick Mulvaney, Raul Labrador, and David Brat . Photo illustration by Juliana Jiménez. Photo By Bill Clark/CQ Roll Call and Chip Somodevilla/Getty Images. 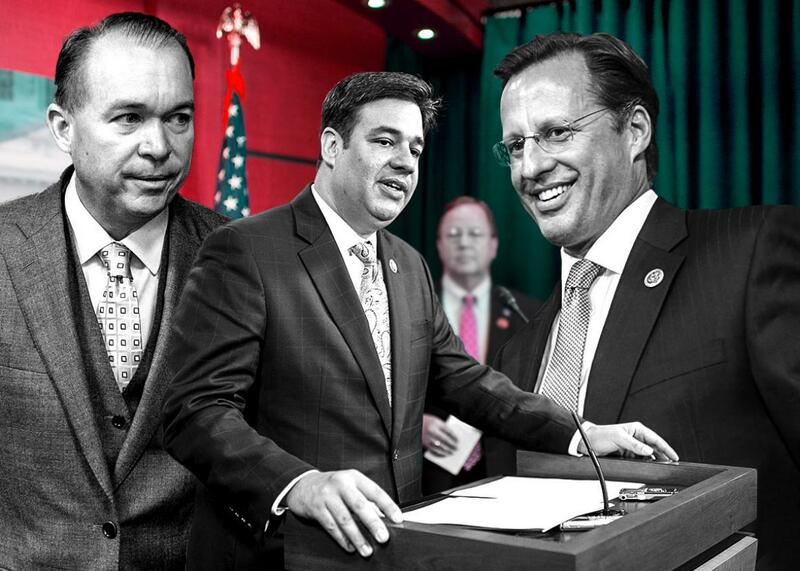 Members of the House Freedom Caucus, the ultra-conservative band of roughly 40 lawmakers who unfortunately hold veto power over the country’s business, are now on the receiving end of the same treatment that they’re usually dishing out. Conservative media and hard-right constituents are calling them sell-out scumbags for offering a “supermajority” of support—though not an official endorsement!—to Rep. Paul Ryan’s bid to be the next House speaker. Doesn’t it just put a tear to your eye? Much of the conservative media industry has been bearing down on Freedom Caucus members for not using their veto power to nix Ryan, the elite, RINO monster who only a couple of years ago was considered a leading spokesman for hardline conservatives. Rush Limbaugh has dubbed Ryan “the new [Eric] Cantor, in terms of moving the donor agenda.” (We’re so old that we can remember when Cantor, too, was the Tea Party’s man in the leadership.) Radio host Laura Ingraham, who played a central role in orchestrating Cantor’s 2014 primary ouster, has been blitzing Ryan relentlessly. Ditto Mark Levin, Erick Erickson, Ann Coulter, and juggernaut Web properties like Breitbart News and the Drudge Report. The members, in response, are begging their constituents and media hosts for a chance to explain. They have material to work with. They can argue that they were able to get Ryan to cave on some of his conditions for serving as speaker, because they did. Ryan backed off his demand that the Freedom Caucus officially endorse him, and he didn’t require any of the rule changes he was seeking before accepting their acquiescence and plowing ahead with his bid. The members can also argue that they got a pledge out of Ryan not to call up a 2013-style comprehensive immigration reform bill—not that there was ever much chance of him doing that, but his prior support for donor-friendly immigration reform (aka a package including “amnesty”) was a major concern among the talk-radio crowd. Ryan has also agreed to follow the “Hastert Rule,” in which he will only take up bills that have the support of a majority of the majority conference. Most likely, Freedom Caucus members will make all of these persuasive arguments about how they bended Ryan to their will before signing off, and it will not matter. At no moment in this process will Freedom Caucus members be deserving of sympathy. It is their fault that the constituents who empower their crusades are unresponsive to reason. When it comes to confronting their constituents with facts, they have been cowards, choosing to fan the prevailing rage rather than challenge it. The far right has not been honest with its constituents about the limits to Republican power in the current configuration of government. Control of Congress gives Republicans leverage in making compromise legislation with the Democrats. But without the White House—and some reform to the modern, lethal filibuster—it is nearly impossible to pass pure ideological wins like a repeal or defunding of the Affordable Care Act or a ban on federal dollars for Planned Parenthood. Instead of explaining these limits to their constituents, these conservatives promise to “fight.” Their battle goes nowhere; Republican leaders are mathematically forced to cave to Democrats, and conservatives blame their leaders instead of themselves for building up false expectations. And they get away with it. The conservative flank has also not been honest with its constituents about the debt ceiling. It does not explain that this is a law that doesn’t make sense. It’s phony leverage, since no leader is likely to allow the country to breach the debt ceiling. And increasing the debt ceiling doesn’t authorize new spending; it merely allows the Treasury Department to finance the spending that Congress and the White House have already passed into law. If these lawmakers ever bothered offering an honest explanation of this stupid statutory limit to their constituents, instead of feasting off of their misunderstanding, perhaps their lives and the state of the country would run more smoothly. It can be done. Until recently, the majority party has taken care of raising the debt ceiling while the minority has voted against it. But when it became clear that the House Republican majority wouldn’t supply all the votes when it took power in 2011, Democrats began explaining the necessity of raising it. Now it’s something that Democratic constituents support. Being honest instead of pandering can work, sometimes. You first have to try. The Freedom Caucus’ irresponsible antics have quite obviously earned them enmity among party leaders, donors, and moderates. In the most comical example of their cowardice, these members are trying to use the speaker’s election process to ensure that they are never put through the same test that Tea Partiers delight in subjecting “establishment” candidates to: primaries. The Chamber of Commerce, which successfully propped up many “establishment” Republican Senate candidates against Tea Party challengers in 2014, is talking about going after more obnoxious House Tea Party members in 2016. The Freedom Caucus wants the next speaker and his leadership team to “step in to make sure that [doesn’t] happen,” according to Rep. Mick Mulvaney. They’re throwing a fit. And, God help him, Paul Ryan is treating this seriously instead of laughing it off. The good news for Freedom Caucus members is that it appears that Speaker Boehner will try to push through a bipartisan, two-year debt ceiling and budget deal package as his last act before Ryan is elected speaker. It’s not good news because Freedom Caucus members will like the sweeping package—early outlines of the deal suggest that conservatives will complain about this like it’s Christmas morning and their parents bought them the wrong color pony. But at least it will be Boehner who brings it to the floor instead of Ryan, the sellout RINO whom the sellout RINO Freedom Caucus allowed to become speaker.